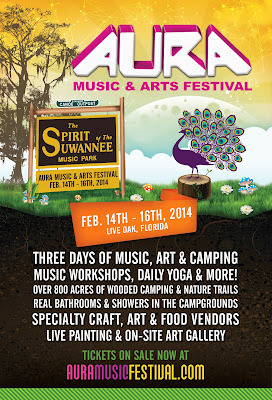 Back for its fifth year, AURA Music and Arts Festival will return to the beautiful Spirit of the Suwannee Music Park in Live Oak, Fla., for three days of rhythmic celebration and creative flow. On February 14-16, AURA Music Group will captivate the minds of music lovers with performances by some of the top names on the festival circuit, as well as a few lesser known acts that pack a powerful punch. Heavy-hitters include Lotus, Papadosio (both scheduled for two sets), and Conspirator, backed by favorites Zoogma, Particle, and Marco Benevento. The Werks, Kung Fu, and Dopapod will also be clocking in two sets each over the weekend. Inspired visual artists, selected by program curator Tim Coffey, will be on display as well as actively creating within the concert area. Artists include Allison Azura, Christian Jaxtheimer, Chris Morphis, and Olivia Curry. Around 15 different yoga and meditation classes and workshops are scheduled, on topics ranging from breathwork and mantras to the flow arts of hoop and poi, organized by program director Joaquin De Teresa. Online registration is also open for AURA 2014’s Disc Golf Tournament. Food and drink vendors, to include Free Lovin’ Foodery, Solar Cafe, and Buchi Kombucha will be serving up some delicious, healthy fare. Merchandise and craft vendors will also be putting their work on display for the weekend. Pete Pinholster of Eagles Nest Outfitters (ENO) has designed a spectacular Lotus Lounge — a silver, circular structure, modeled after the lotus flower, capable of supporting a number of hammocks and housing a DJ booth and light show — that will provide a place to relax and be entertained. Tickets are currently $145, with a price jump to $155 taking effect Jan. 16. They will still be a steal at the gate at $165. For an extra $30, you can arrive a day early and join in the first ever official onsite preparty, featuring festival act The Heavy Pets and guests Greenhouse Lounge and The Funky Nuggets. VIP packages, starting at $250, are also available, with amenities like access to a heated VIP lounge, complimentary massages, daily meet and greets with musicians, and much more. Spirit of the Suwannee Music Park also offers attendees the option to purchase cabins and RV hookups, in addition to public bathrooms and an onsite general store and restaurant. Campfires will be allowed in designated areas and there is plenty of room for car camping. There is also still time to apply to be a part of the Suwannee Ticket Exchange Program and receive admission in exchange for 15 hours of volunteer work. Gates open Wednesday, Feb. 12, at noon and will be open 24 hours a day until the close of the event. In the meantime, Live From AURA Studios is setting fans up with live streaming events with their favorite bands. Past concerts have included The Mike Dillon Band, Consider the Source, and The Mantras.